The past years of my life have kind of been diligent exploration of electronic and instrumental hiphop. I practically put myself on a mission to discover the inner-workings of this clash of eras and the influential artists therein. This mission placed me in a rather chilled atmosphere of the Gretchen Club just some weeks ago to absorb a DJ set by Thomas Schillebeeckx aka Poldoore - a producer I've had my ears on for some time. Days following the show, I exchanged some messages with him and got word that he was about to release an album, which I, upon listening, believe is setting a whole a new norm for beat production. Released on April 1st, The Day After presents an array of styles that have musically fostered new personal outlooks for me. Thomas was cool enough to clue us into what he’s up to now and even a bit about what it took to complete this monumental album in his ever-growing musical career as an international man of fresh beats. Hey Thomas, thanks again for sitting down with us. The hard work you put into this album The Day After really shows. Was there any overarching theme or message attached to the album? Hey Mike, my pleasure, thank you so much for having me. Personally, while making music, I’m usually not trying to convey a certain message, but rather attempting to shape the mood I’m in at that particular time into a piece of music. As you can hear on the album, every song on there has a pretty cinematic, atmospheric vibe to it, because it’s some sort of personal soundtrack. “Midnight in Saigon” is a smooth jam with a late-night feel to it. What’s the song about? When I started that song it was actually around midnight, and I was picturing myself walking around at night, alone in a big, vibrant Asian city. In this track you can hear a combination of sounds from the past (a Fender Rhodes piano, jazz guitar, trumpet), present (straightforward drums and vocals) and future (a spacey arpeggio and warm synth pads). In a way, it therefore translates the image I have of Saigon: a stretched out city with both traditional, contemporary and futuristic elements. Astrid is a very talented vocalist from my area, and she perfectly translated the atmosphere I was going for into the lead vocal. What was one big take-away or lesson learned during the production of The Day After, whether personal and/or professionally? You’ve been doing a lot of touring across continents and introducing new elements to the live show. Overall, what do you try to put across in your live sets? I have indeed been travelling and playing around a lot, and I absolutely love it. When I was working on the live show I spent a lot of time figuring out a smooth track list. I want to make sure there’s a nice transition between the different songs and their particular vibes in order to create a fluent sequence of music. The shows mostly start out a bit slower and softer, but gradually the tempo increases and a funky, more danceable atmosphere arises. I love both uptempo and downtempo music, so I try to combine both in my live and DJ sets. If you ever get the chance to see him throw down a live or DJ set, DEFINITELY do it. 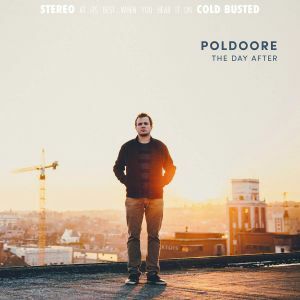 Don't forget to check out the iTunes link above to get your hands on The Day After by Poldoore. You can also stream the album via BandCamp and Youtube.